I am hanging my head in shame as I type, knowing that I gave myself a right talking to in the last post about not writing enough - and look where we are now! However, can I be forgiven by making my last post of the summer a bit of a blinder?! This weekend was THE wedding. The wedding of Mr and Mrs Percy; two of my most favourite people in the world. Family weddings always involve a lot of clubbing together as the day draws near to get everything ready for the big day, and this weekend was no different. 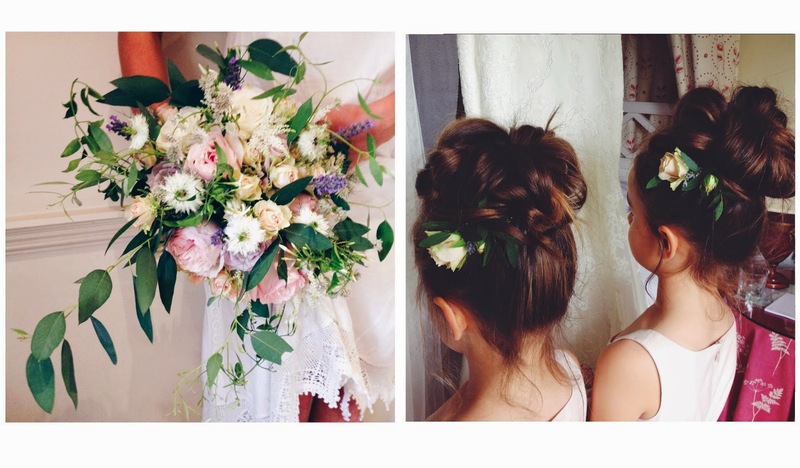 Victoria had chosen a palette soft pinks and dusky lilacs for the wedding with touches of silvery foliage, and matching flowers to this brief was a rather lovely task. I chose garden roses in these soft hues paired with frilly little spray roses and lots of trailing jasmine and foliage as well as lots of textured bits and pieces. Homegrown lavender, mint and rosemary also featured, collected from the gardens and allotments of my mum and nana - a family affair indeed! The words 'Old English romance' bounced around my head the day before as we filled the car with blooms and set off for rural Yorkshire. 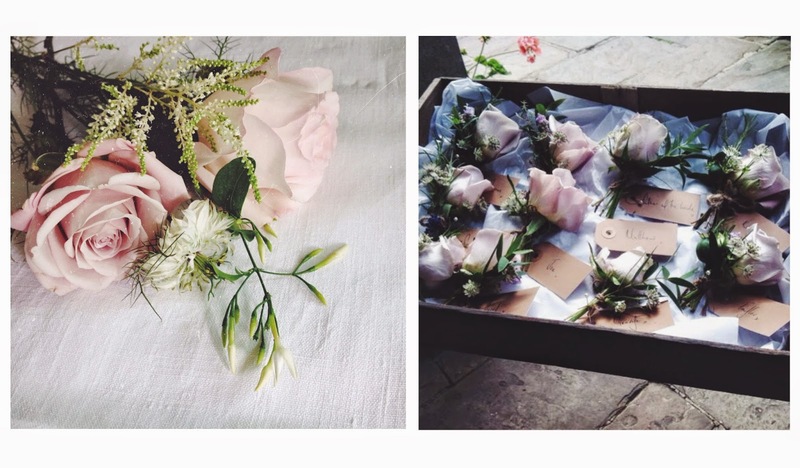 Armed with pinnies, scissors, vintage ribbon and lace and a collection of beautiful plain and mercury glass, I set to work creating an array of ceremony vases, table centres and of course (my favourite bit) the bridal party bouquets and buttonholes. By my side all weekend was my very own mum, who worked like a trooper and is an absolute floral legend in her own right, as well as Ross' mum who collected all the offcuts to fill mini bud vases that were dotted around the tables. It was lovely - not only getting to work with my family but also being able to enjoy all our efforts the next day. 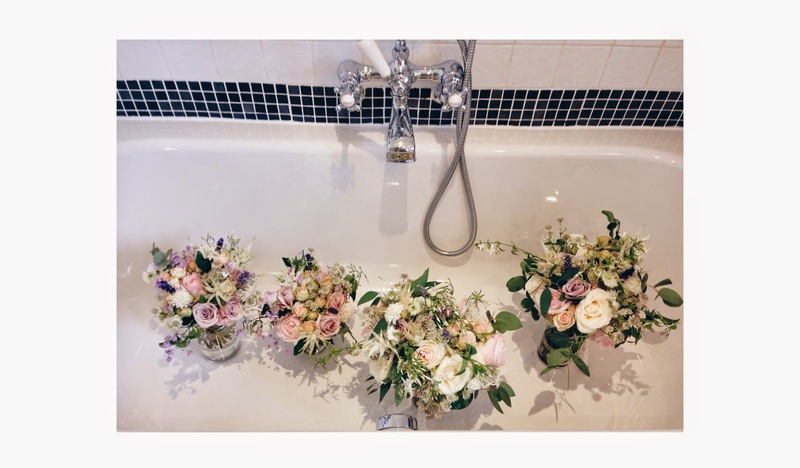 I am usually creeping around delivering bouquets and table centres well before the 'I do's ' and always end up leaving just as the celebrations are beginning, so it was such a pleasure to see everything in place and see others enjoying them too. Below are a few snapshots I managed to take the day before, and I promise to share more photos as they appear. So as we wave farewell to a very great summer, I happily say hello to September and all it has to bring. I love the seasons we have in this country; the predictability of whats to come and the new flowers, colours and textures of the season. I love the change in the air, those crisp but sunny autumn mornings and the comfort of blazing fires and woodsmoke. I am already planning my perfect bonfire night menu (something my sister-in-law and I get stupidly excited about) and have already been in discussion about Christmas workshops at Verity & Thyme - stay tuned! 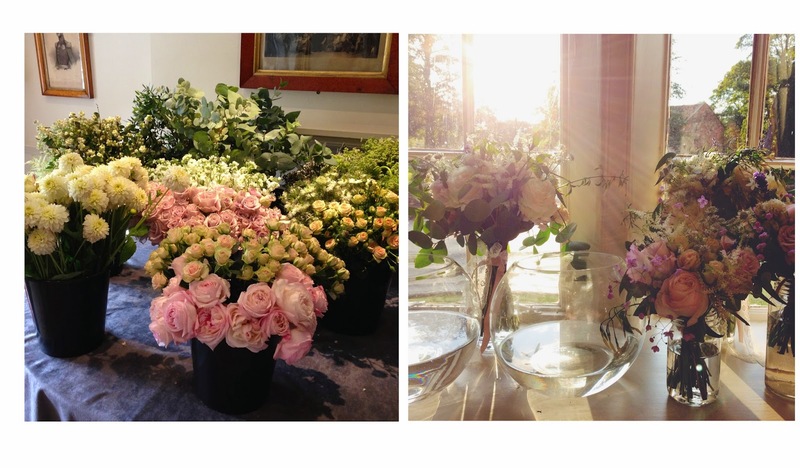 The flowers are stunning as always, love seeing the beautiful creations you make.